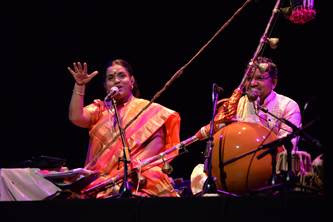 The opening ceremony at Victoria Theatre opened with due fanfare, featuring an atmospheric film on the theme of Aram by Young Artist award winner and photographer Alecia Neo, an impassioned commissioned piece titled Ocean Free by dynamic poet-musician Deborah Emmanuel and DJ-producer Kiat as well as engaging Tamil folk art storytelling by way of the villu pattu (the “bow song”) by Bharathi Thirumagan’s group all the way from Chennai, India (the bow is an age-old weapon of warriors adapted into a musical instrument). Singaporean poetess, Anne Lee Tzu Pheng, was also meant to do a reading, although at the last minute, there appeared to have been a glitch. 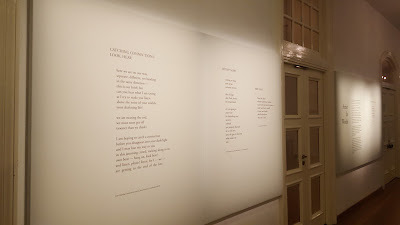 No matter, prominent displays of her verses are available on view as an exhibition in Gallery II and all along the corridors of the Arts House, and these words provide moments of quiet reflection for the prose aesthete where words stand out round and whole about cadence and connection, seeing and hearing, and its debt to other art forms. Exhibition of Anne Lee Tzu Pheng's poems, Gallery II and corridor, courtesy of Elaine Chiew. Also worth mentioning is the cross-reach work the SWF has done with agencies and platforms such as Tamil Murasu (given the dominance of Mandarin Chinese in Singapore, this spotlighting is welcome and consequential), as well as the expansion of access for those sensory-impaired (this especially has my applause even though wheelchair access to the Arts House is still not possible). I wandered onto Lyrical Éire: An Irish Night of Words and Music, a collaborative performance consisting of prose and poetry readings and some singing(!) 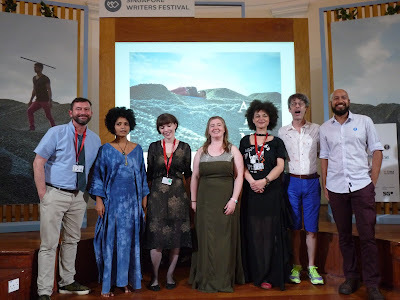 by six Irish writers and two Singaporean writers. 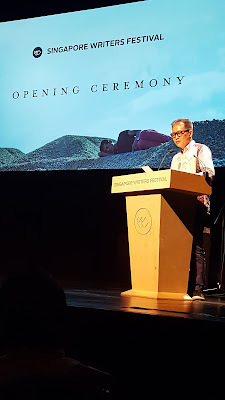 Here, Singaporean poet Deborah Emmanuel demonstrated once again her impressive stage presence, and it was delightful to hear author and friend Paul McVeigh bring The Good Son to life through voice and gestures. Both Julian Gough and Cat Brogan somehow managed to cram entire centuries of Irish history in 4 to 7 minutes, respectively, all rendered in charming Irish lilt. 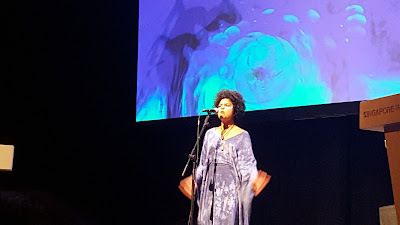 Despite the overwhelming Irish authorial presence, Marc Nair held his own with his poem The Suitcase with its theme of movement, emigration and refugee striking a resonance with Abby Oliviera’s poem about the push-and-pull of a place “you hardly dare to name” that’s also home. SWF this year has drawn some international literary heavyweights – Simon Armitage, Rae Armantrout, Junot Diaz, Etgar Keret, Lu Min, just to name a few – and includes an exciting focus on speculative fiction, which brings in JY Yang, Marjorie Liu, Jay Kristoff and Ken Liu. The crème-de-la-crème of Singaporean literary talent will also weigh in on many different panels and subjects and this commingling of the local and the global, this sheer variety of multiculturalism and diversity, this mix of voices is indeed a particular richness offered by SWF, as festival director Mr. Yeow Kai Chai said in his opening speech. I, for one, look forward in anticipation to the heady mix of diverse viewpoints, debates and ideas about how indeed one can and will “do good,” how the layered and complex interplay of conscience, virtue and societal values given today’s challenges and crises resound in literature. What indeed does it mean to be a writer today within the textual underpinnings of ‘aram’?